Crochet Hook:Size F-5 (3.75 mm) or size needed to obtain gauge. Single Crochet Decrease: (sc dec):Draw up a lp in each of next 2 sts, yo and draw through 3 lps on hook. 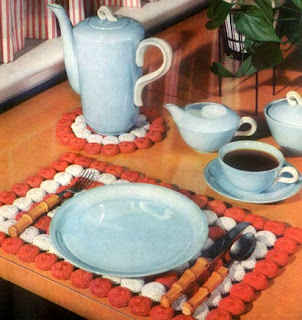 Double Loop Stitch (dlp): Loop stitch is a variation of single crochet and is usually worked on ‘wrong side’ rows because the loops form at the back of the fabric. 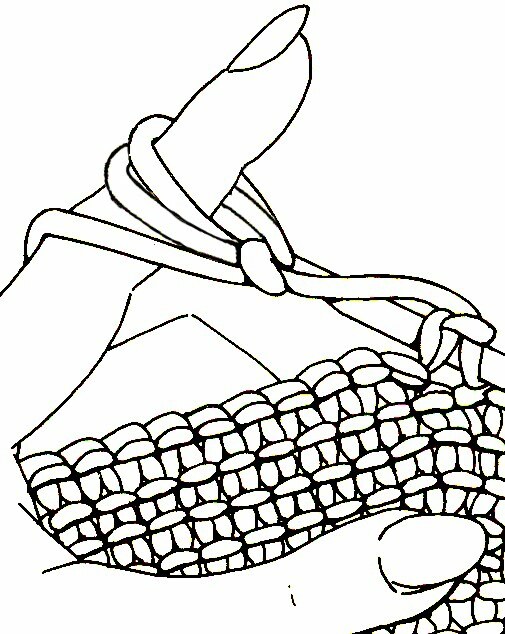 Using the left hand finger to control the loop size insert the hook in st indicated, wrap yarn around index finger of left hand twice more. Insert hook through lps on finger following direction indicated by arrow (see Fig. 1a), being careful to hook all loops (see Fig. 1b), draw through st pulling each lp to measure approximately 1”, remove finger from lp, yo and draw through all lps on hook. Rnd 5: Ch 1, turn, dlp in each sc around; join. Rnd 6: Ch 1, turn, sc in each dlp around; join. Rnd 7: Rep Rnd 5. Rnds 9-18: Rep Rnds 5-6. Rnd 19: Rep Rnd 5. Rnds 21-30: Rep Rnds 5-6. Rnd 33: rep Rnd 5. Rnd 35: Rep Rnd 5. Finish off leaving long end. – Stuff and shape body. Using long end, sew Body closed using invisible stitches. Rnd 1: Ch 2, 6 sc in 2nd ch from hook, join. Note: Ch 1, turn each rnd. Rnd 2: 2 dlp in each sc; join. Rnd 4: Dlp in each sc around; join. Rnd 10: Rep Rnd 4. Rnd 11: Sc in each dlp around; join. Rnd 12: Dlp in each sc around; join. Rnds 13-16: Rep Rnds 11-12 twice. Rnd 17: * Sc in next 3 dlp, sc dec; continue from * until Rnd is finished; join. Rnd 18: Dlp in each sc around; join. At the end of Rnd 20, finish off leaving long end to sew Head to Body. – Stuff Head and sew to Body. Rnd 6: Rep Rnd 4. Finish off leaving long end to sew Feet to Body. – Stuff each foot lightly. 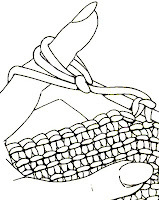 – With right side facing, hold two ears together and crochet around edge with CC. – Position Ears on Head and attach. Rnd 1: With finer yarn and smaller hook, ch 14, join. Ch 1, sc in each ch. Rnds 2-3: Sc in each sc. Rnd 4: Sc in next 9 sc, ch 1, skip next 4 sc (for thumb), sc in next sc. Sc in next 8 sc, sc in the ch-1 over thumb. Rnd 6 to end: Dec 1 st in each rnd until 4 sc remain. Finish off leaving long end. Thread into needle and draw together. 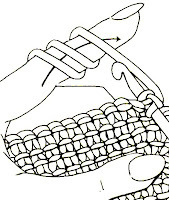 Thumb – Join yarn and work 3 rnds of sc even, finish off leaving long end to draw tog as top of Mittens. 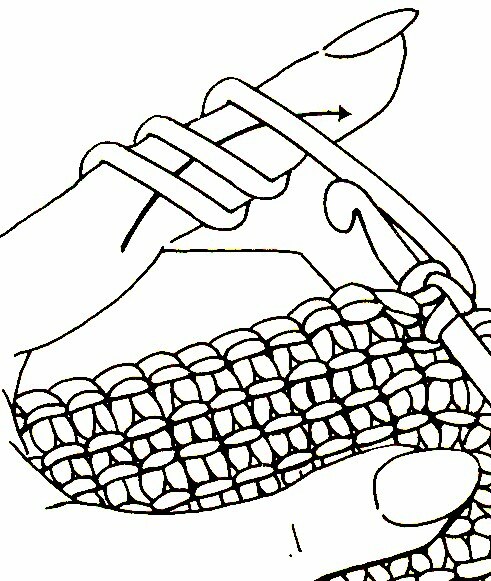 Cuff – Join yarn to wrist of Mitten, ch 3, 2 dc in same sp, ch 1, skip 1 st, * 3 dc in next st, ch 1, skip 1 st, sc in next st, ch 1, skip 1 st, rep from * around; join. Finish off. 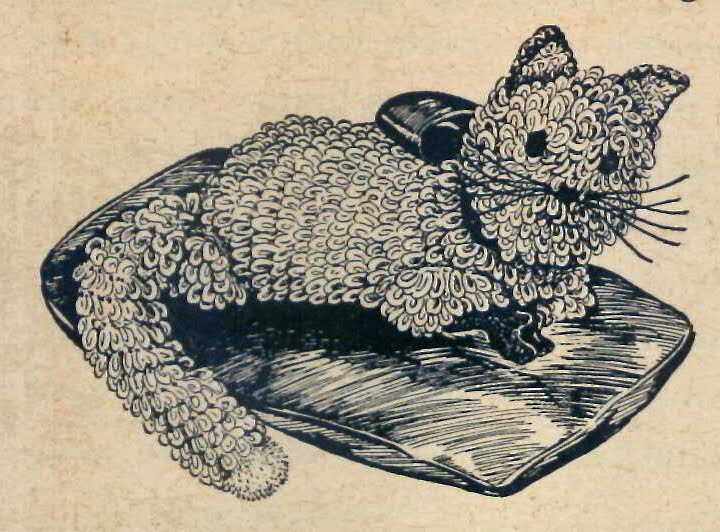 – Join yarn at one front paw, run yarn through cuff of each mitten and join to opposite paw. Rnd 3: Sc in each dlp around; join. Rep Rnds 3-4 fourteen times. Finish off leaving long end to sew Tail onto Body. – Stuff tail and attach to body. Using a piece of cardboard one inch in diameter, wind yarn around it about 40 times. Tie through center and slip off cardboard. Cut edges and trim. This makes a pompom which can be fastened to end of tail. Send us your pictures. We’d love to see them. Please send pictures if you make it. Oh Maggie! I love this kitty pattern and your unique way of crocheting the loops! But of course, I love cats, too ~ :>) This one will definitely be added to my kitty group on my bed! Thank you so much for sharing with us. I must try this pattern real soon!!! It looks so cute & the LOOPs…awesome!